My name is Ryan Reece Ravalier due to its uniqueness was always destined to make headlines, that according to many teachers and workers both past and present. From playing the beautiful game known as football to analysing and writing about it and it is how I best describe the transition of my teen years to adulthood. My love for football is like no other, put it this way news isn’t news to me in regards to football and the sporting world. I’m also a beloved Manchester United fan, so ideally you can refer to me as one of those loathed London Mancs. Since the age of 5 I was never kept away from the lures of hip hop beef and up to now can still remember the day when my sister broke down and told me that Biggie died. I guess that explains why I am such a hip hop head. And that pretty much sums me up really. Hi my names Tarela, I’m fan of various sports and currently a student at Coventry University studying Business and Accounting. I am one of the sports writers on the team, having joined after started my own blog to give my view on issues going on in the world of sports. As well as lifelong long Manchester United fan, I also support the Miami Heat of the NBA and the Washington Redskins of the NFL. My favourite sports players are Lebron James Chris Paul, Andrea Pirlo Andreas Iniesta and Andy Murray. I love sports video games and my favourites are Football Manager and NBA 2K13 as they are so engaging and extremely difficult to tear away from. Hey guys! My name is Tolu and I will blessing the pages of Urban Revolution with interviews from creative up and coming fashion bloggers, designers, and stylists. I’ve always found inspiration in those hard working, determined, great people who turn their ideas into action and defy all the odds. So it’s only right I meet those people and interview them so their passions in whatever they may be (in this case fashion), can also inspire and motivate you guys to do what moves you. I hope you all can take in, enjoy and from the interviews you read. Always remember carpe diem and do what moves you, who know what someone else can take from your story. My name is Ryan Reece Ravalier. Due to its uniqueness was always destined to make headlines according to many teachers and workers both past and present. My love for football is like no other, put it this way, news isn’t news unless football is involved. I’m also a beloved Manchester United fan, so ideally you can refer to me as one of those loathed London Mancs. Since the age of 5 I was never kept away from the lures of hip hop beef and up to now can still remember the day when my sister broke down and told me that Biggie died. I guess that explains why I am such a hip hop head. And that pretty much sums me up. Hi my names Tarela, I’m fan of various sports and currently a student at Coventry University studying Business and Accounting. I am one of the sports writers on the team, having joined after starting my own blog to give my view on issues going on in the world of sports. As well as lifelong Manchester United fan, I also support the Miami Heat of the NBA and the Washington Redskins of the NFL. My favourite sports players are Lebron James, Chris Paul, Andrea Pirlo, Andreas Iniesta and Andy Murray. I love sports, video games and my favourites are Football Manager and NBA 2K13 as they are so engaging and extremely difficult to tear away from. Hey guys! My name is Tolu and I will be blessing the pages of Urban Revolution with interviews from creative up and coming fashion bloggers, designers, and stylists. I’ve always found inspiration in those hard working, determined, great people who turn their ideas into actions and defy all the odds. So it’s only right I meet those people and interview them so their passions in whatever they may be (in this case fashion), can also inspire and motivate you guys to do what moves you. I hope you all can take in and enjoy from the interviews you read. Always remember carpe diem and do what moves you, who know what someone else can take from your story. Hey my name is Alice Favour and I LOVE makeup, so I’m really happy that I am able to share my makeup tips and all things related to beauty within the Urban Revolution magazine. My interest in the application of makeup started about 2 years ago and my passion for it has continued to grow since. The creativity that goes into the application of makeup, especially when creating an eyeshadow look is what gets me excited. It’s simply amazing. I truly hope that the articles I write, inspire you to experiment and be creative with your makeup looks, as well as inform about the latest makeup and cosmetics products that are great in both in quality and value. Hi, my name is Esther; I am a Creative Writing and Journalism Graduate and Blogger. I enjoy: - art, beauty, fashion, music and writing. On the flip side my passion also lies in discussing serious matters such as social issues which is one of the reasons why I started blogging. 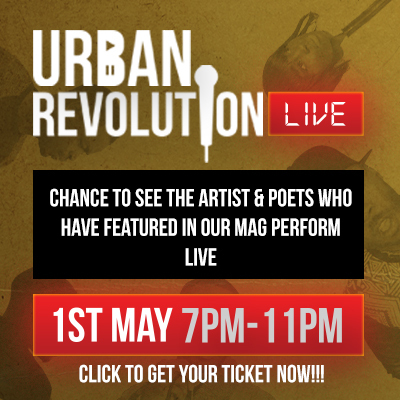 I am a writer for Urban Revolution’s debate and discussion page. This a great way for me to share my perspectives on things that are relevant, recent and of interest to younger people today. I like to get people discussing things that affect them personally and as a people, be it positive or negative. I hope to not only engage readers but also create an interactive outcome getting people to really talk about the topics raised in the debate and discussion articles and say what they think about them.